Founder and director of the estate since 1985, he is an independent winegrower who believes that the strict respect of his production principles are a guarantee of quality. His wines are regular award winners. Marie-Claire, Luc's wife, has taken care of the commercial and financial side of the business since the beginning; she is also the export manager of the company. Marie-Claire started the Bed & breakfast activity in 2004, motorhomers are also welcome since 2007. She welcomes the customers in French, English, German, and Dutch. They both work with Luc taking care of the vines throughout the year and elaborating fine wines. 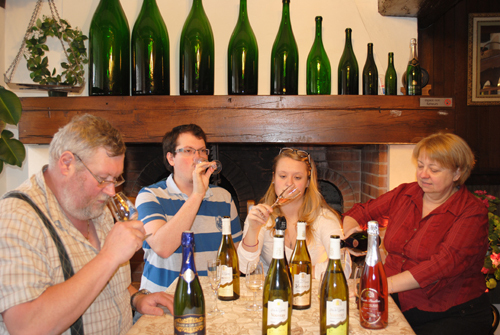 Marc (24) and Pauline (22), Marie-Claire and Luc's children, are part of the estate life with their own cuvées. The "Cuvée Marcus", a still tender medium-dry A.C. Vouvray, delicate and fruity; and the "Cuvée Pauline", a sparkling rosé A.C. Touraine with a lovely berry touch. You would be able to meet Marc and Pauline at the estate or on wine fairs where they help their parents out.